Located near the southern end of Brooklyn, Breadberry is positioned as a market catering to people who are “passionate about food and wholesome ingredients.” The store includes a bakery, sushi bar, a “curated collection” of artisan cheeses, a constantly evolving deli menu, sandwich counter and hot food bar, among other gourmet and homestyle traditional specialties. Online shoppers enjoy a variety of options that enhance customer service, according to Breadberry owner Sam Gluck. “And customer service is our number one priority,” he said. Breadberry’s trendy image extends throughout the website, with both graphics and content designed to enhance the store’s unique brand. “We created a special feature for Breadberry to display their popular monthly recipe publication, The Taste,” said My Cloud Grocer chief technology officer Yehuda Vernik. Recipes help generate website traffic which then, if done correctly converts into sales, according to My Cloud Grocer’s Dan Dashevsky. Breadberry owner agrees, noting, “We get plenty of compliments on the website, and our sales keep growing.” Since going online, Breadberry’s reach has expanded to include delivery to multiple neighborhoods in Brooklyn, Manhattan and Staten Island. Local supermarkets like Breadberry have only recently jumped on the online shopping bandwagon. The technology was not ready, Dan Dashevsky said, and customers have been skeptical. 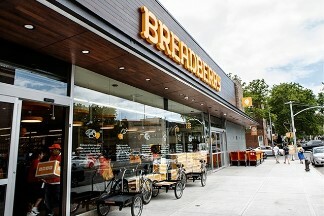 But now people can even shop on the go by using their smart phones to log into breadberry.com’s mobile friendly site. “With a few clicks, their groceries are delivered to their doorsteps, saving time for what really matters,” he said. My Cloud Grocer provides comprehensive end-to-end e-grocery solution, from the customers’ shopping experience and the store’s selection of the items in their order through payment processing, logistics and delivery. The platform is designed for supermarkets to quickly integrate their brick and mortar stores into an online environment.